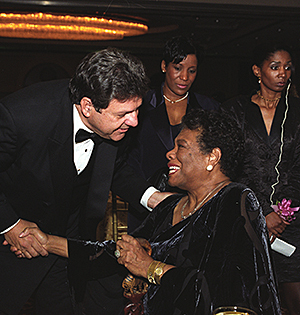 Val J. Halamandaris, President of the National Association for Home Care & Hospice (NAHC) joined millions of people around the world in lamenting the loss of author, poet, and Caring Award honoree Maya Angelou. When she received the award, she talked about the importance of serving others and bringing more love into the world. “Our greatest urge is to be loved,” she pointed out. “The most hateful person, the most actively cruel person, acts out of a need to be loved. The need to be loved is fundamental. I believe it is love that links those molecules in the DNA. It is love that holds us together as human beings,” Angelou said.